Nearly thirty unsung heroes and their families attended the Chair’s Community Awards at South Gloucestershire and Stroud College’s WISE Campus last night (Thursday 17 March). 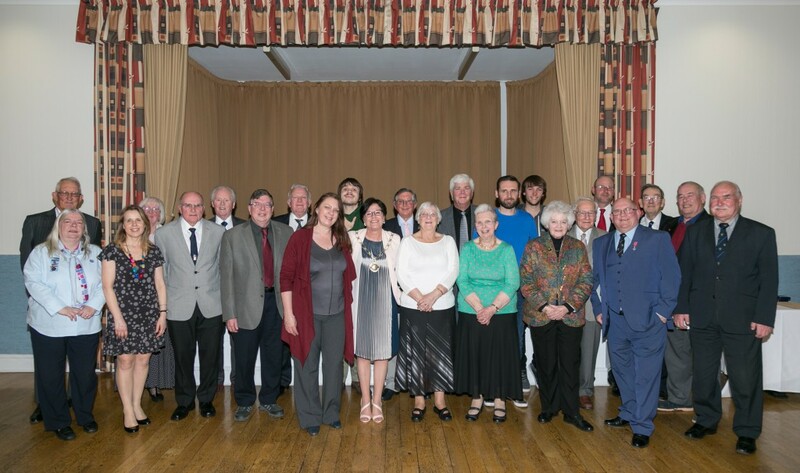 The annual awards recognise and celebrate the valuable contribution local unpaid volunteers make to life in South Gloucestershire. These people give up their time freely to help others and bring our communities together, and were rewarded for their efforts at the special ceremony. Chair of South Gloucestershire Council, Cllr Erica Williams attended along with the Lord Lieutenant of Gloucestershire Dame Janet Trotter and Vice Lord Lieutenant Robert Bernays, Group Chief Executive & Executive Principal of South Gloucestershire & Stroud College Kevin Hamblin and Principal and Deputy Chief Sara-Jane Watkins. Throughout the evening award winners from a wide variety of backgrounds were presented with their certificates by Cllr Erica Williams and Sara-Jane Watkins. The final round was the Lord Lieutenant’s Special Award, which saw Dame Janet Trotter and Robert Bernays present £100 to Dr Derek Dominey for his valued services supporting people with dementia in South Gloucestershire. Derek joined the development committee of Alzheimer’s Society as a volunteer and soon became Chair of the Bristol & South Gloucestershire Branch, representing the Society in the implementation of the National Dementia Strategy from 2009. Derek is well known and respected throughout the district and has joined many groups over the years such as Dementia Steering Group, Dementia HIT of which he is Chair, AWP Carers Forum, Carers Centre, and many more. He has also been involved in the Joint Strategic Needs Assessment and the carers strategy. Derek is a strong advocate for younger people with dementia and he always ensures that the views of carers and people with dementia are listened to and taken into account. Chair of South Gloucestershire Council Cllr Erica Williams said: “Our Community Awards have been running since 2003 to celebrate the contribution local people make to life in South Gloucestershire and over 400 people have received an award since they started. Our annual awards event is sponsored by South Gloucestershire & Stroud College and offers the perfect opportunity to celebrate the hard work and dedication of volunteers in the community who display outstanding commitment in giving up their time and effort to help others. The evening also saw students from the Level 3 Musical Theatre Year 1 group, based at WISE campus of South Gloucestershire and Stroud College perform some of their latest productions.